Life cycle: 10 to 20 generations per year. Hibernation in the winter occurs in the egg stage on weeds or field crops. Plants preferred: The pea and bean plants. Feeding characteristics: They damage the foliage and pods when the infestations get out of control causing serious damage. Physical description: This Aphid is green and 1/5 inches long. 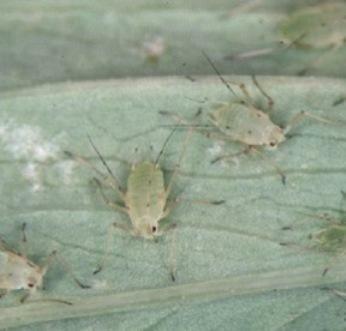 Controls: Spraying the foliage with soapy water and rinsing with clear water will control this insect. For serious infestations dust with sabadilla.